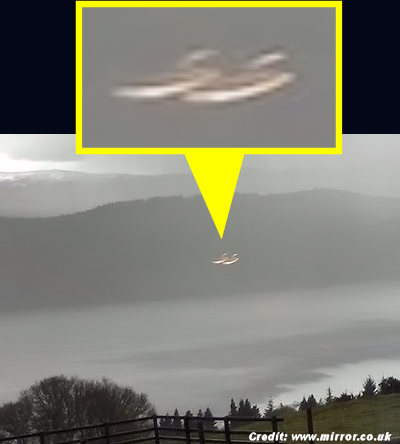 Alan Betts was on holiday with his wife, Anna, when the group captured this extraordinary image of two mysterious disc-shaped objects flying over the famous loch in the Scottish Highlands. A mysterious photo appears to show a pair of UFOs hovering above the home of the Loch Ness Monster. Stunned Alan Betts was on holiday with his wife, Anna, and her parents when the group captured this extraordinary image of two mysterious disc-shaped objects flying over the famous freshwater loch in the Scottish Highlands. The picture was taken by Anna's mum Tatiana, but it wasn't until Alan and his wife returned to their home in York and started looking through their holiday snaps that the bewildered couple discovered the strange white shapes hovering over the loch. . . .